What is the Weekly Summary, and how can I personalize it? Details on how the Weekly Summary (a.k.a. newsletter) works, and how to it set it up to send automatically. 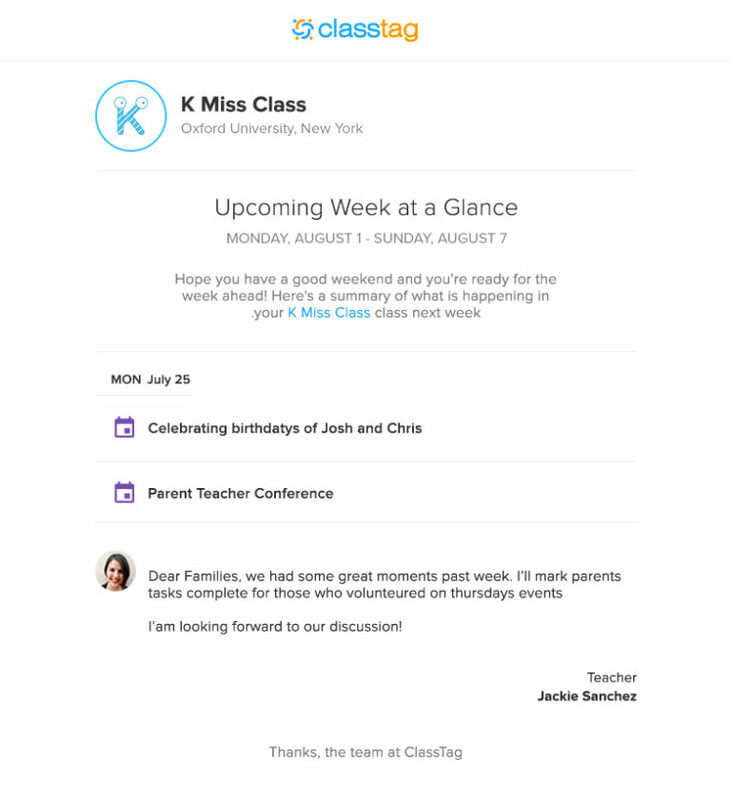 To give teachers a simple, effective, and creative way to organize their classrooms, ClassTag offers one of the biggest time-saving opportunity that a teacher can take advantage of: the Weekly Summary. The Weekly Summary is an automated parent weekly newsletter with all the upcoming activities every week. It sends a personalized email to each parent to show their week at a glance, including what they have signed up for and what is still available. It is also sent as SMS with a link to view the whole content in the app. Instead of spending hours on paper notes, you can automate your essential communication with the Weekly Summary. It is designed to replace labor-intensive paper newsletters. You only need to set this up once and the parents will receive a summary of the upcoming classroom activities every week. There is no need to manually create it, ClassTag does this for you. By enabling the Weekly Summary, you will not have to scurry around informing your parents about the coming week. At the same time, you are also creating a consistent communication system in your classroom. 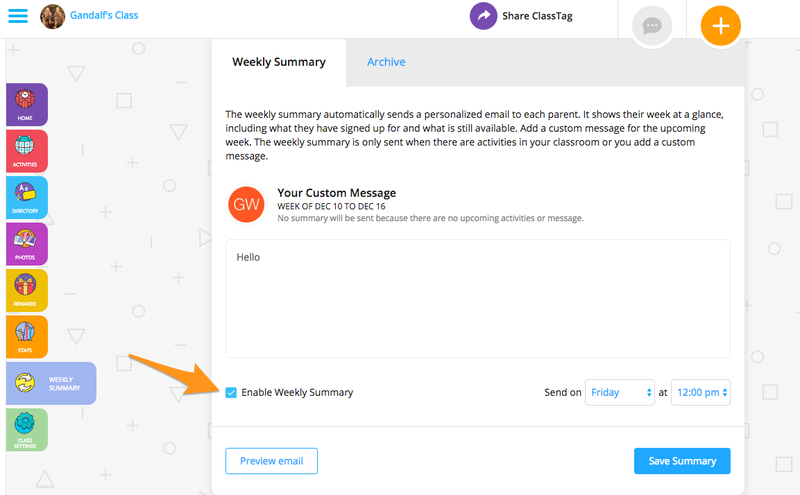 The Weekly Summary feature of ClassTag helps teachers and parents in many ways. In our recent survey, over 50% of participants mentioned difficulties reaching all parents. It is a struggle engaging with parents when you cannot even reach them. Parent engagement is one factor to ensure a child’s success in school. With the weekly newsletter, all parents can be included in the school life. We have heard from countless teacher who reached their most important parent engagement goals by sending weekly summary. The Weekly Summary can be accessed by going to your classroom and clicking the Weekly Summary tab on the left menu. It is enabled by default. To truly benefit from the Weekly Summary you have to persistently add upcoming Events to ClassTag. The system can only inform the parents about the activities that are in the system. The Weekly Summary then pulls everything you have scheduled for the week ahead and delivers a clear and concise overview to the parents’ inboxes in the form of a newsletter. 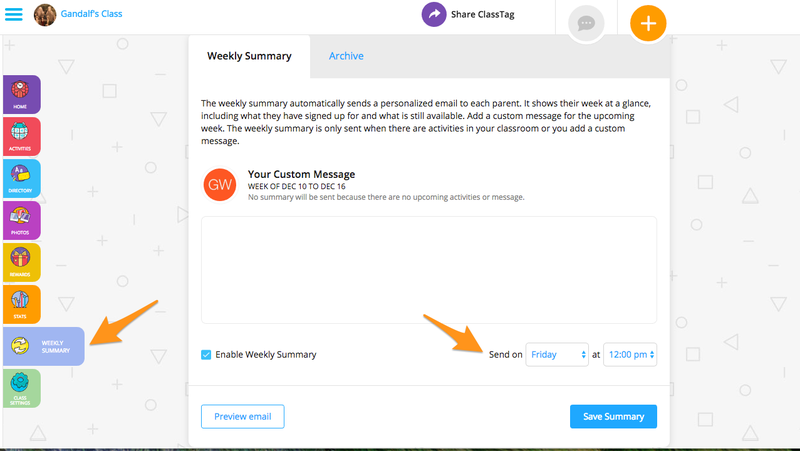 Pro Tip: Parents don’t have to join ClassTag to receive the Weekly Update actively. They are included in the communication from the moment their email or phone number is added to the Directory. Additionally, parents can modify their mail settings for all automated communications, so that they’re never overwhelmed with too many updates. Even though the Weekly Summary is automated, you have plenty of options to customize it and make it your own. The default day it is sent is on Friday but you can choose what day and time your weekly summary goes out. 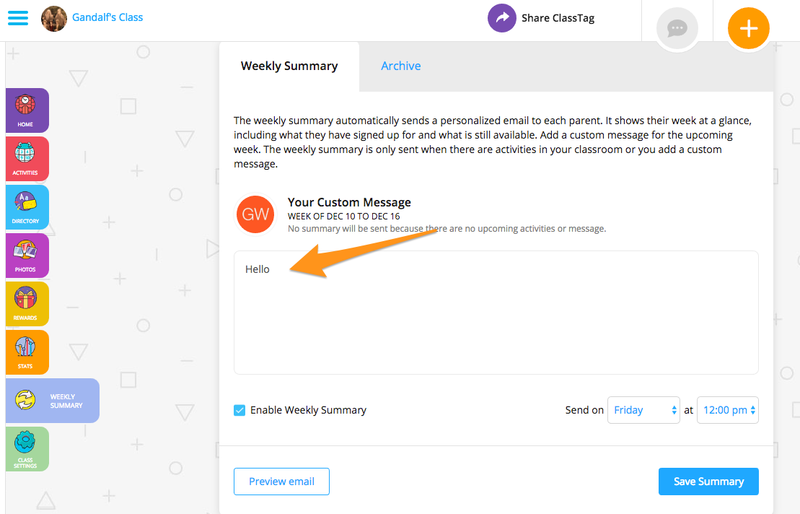 You can also add a custom message to parents or skip that, knowing that they will still receive an update – without you lifting a finger! Additionally, you can select the language the Weekly Summary is viewed by the parent. CAN I CHANGE THE DATE WHEN THE WEEKLY SUMMARY IS SENT? Log in to your ClassTag account. Click the three horizontal lines on the upper left side and choose the correct class. Go to the Weekly Summary tab found on the left side menu. On the bottom right side of the page is where you can change the day and time when you want the Weekly Summary sent. Hit 'Save Summary' after. HOW CAN I ADD A CUSTOM MESSAGE? On the box provided, add the text you want added to the newsletter. You may change this every week or not. You may also leave this space blank if you do not want to add a custom message. At this time, there is not a way to adjust font size, to underline the text, or use bold print. CAN I TURN OFF THE WEEKLY SUMMARY? Sure, you can. Just log in to your ClassTag account. Click the three horizontal lines on the upper left side and choose the correct class. Go to the weekly summary tab found on the left side menu. Uncheck the box that says “Enable Weekly Summary”. CAN I ADD PHOTOS TO THE WEEKLY SUMMARY? You can add photos and videos to a Story, Announcement, and Events but, at this time, the Weekly Summary does not yet pull up these files. Rest assured, we have heard your feedback and will look into adding this feature in the future.